I’ve always been inspired by history. As a child, the books I treasured most were the Ladybird History series, bringing to life the stories of inspiring historical figures as well as famous kings and queens. I also loved to write and illustrate my own stories. I carried both these interests into my adult life. I always kept a journal, tried my hand a short-stories and drafted a couple of full-length novels over the years, none of which saw the light of day. It wasn’t until I embarked on research into my family history that I had the idea for a novel which eventually led me down the road to publication. My father served in the Indian Army in the 1930s, signing up during the depression when there were very few jobs available in London. He was sent out to India and stationed on the North West Frontier for several years, and volunteered to serve in the Malaya campaign during at the start of World War II. Ann Bennett has just taken over our monthly column, Indie Spotlight, which focusses on indie authors and self-publishing. Ann published her best-selling Bamboo trilogy, Bamboo Heart, Bamboo Island, and Bamboo Road, conventionally, through Monsoon Books. All three novels are set during and after World War Two, in Burma, Malaya and Thailand. Bamboo Heart won the inaugural Asian Books Blog Book of The Lunar Year, for the Year of the Horse. Ann chose to self-publish her most recent novel, The Foundling’s Daughter. It concerns a mystery with its roots in British India, during the Raj. To kick-off as our new columnist, Ann here introduces herself, and her work. Hello, I’m Ann Bennett and I’m delighted to be the new regular contributor for Asian Books Blog. A bit about me. I’m English. I live in Surrey and work in London, but I have a passion for Asia particularly South East Asia. I took my first trip to the region in 1985 when I was in my early twenties, travelling from Bangkok to Bali, via Singapore, by public transport and have returned many times since. My interest was first kindled because my father had been a prisoner of the Japanese in Thailand and I wanted to find out about where he’d spent the war. He’d served in the Indian Army in the 1930s on the North-West Frontier near Quetta, and had volunteered to be posted to the Malaya campaign where he was one of the 100,000 Allied soldiers captured by the Japanese at the Fall of Singapore in February 1942. As a prisoner of war he worked on the Thai-Burma railway in several camps in Thailand and ended the war in Shirikawa Camp in Taiwan. He managed to survive three and a half years of starvation, disease and brutal treatment, and the sinking of his transport ship, the Hofuku Maru, but he retained a life-long love of India, and could speak fluent Urdu. He died when I was a child, and as I grew older I became increasingly interested in finding out about what had happened to him during the war. 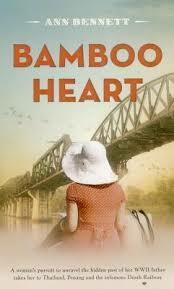 My research into my father’s wartime experiences gave me the idea for my first novel, Bamboo Heart. Dad’s own story, which I discovered in his Liberation Questionnaire in the National Archives in Kew, London, formed the basis of the plot. Bamboo Heart was published by Monsoon Books in 2013. It was shortlisted in the best fiction category for the Singapore Book Publishers Awards and won the Asian Books Blog’s award in the Year of the Horse. I followed it up with two further books about the second world war in South East Asia; Bamboo Island, about a rubber planter’s wife who is caught up in the Japanese invasion of Singapore, and Bamboo Road, about a member of the Thai underground whose life is ripped apart by the war. I’ve just released my fourth novel, The Foundling’s Daughter, which is partly set in British India of the 1930s. This is my first experience of self-publishing, so I am learning the ropes with a bit of help from friends who have already trodden the path. The Foundling’s Daughter tells the story of three women connected across the decades by mysterious events that took place in an orphanage in England in the 1930s that has its roots In British India. One strand is the story of Anna Foster, told in diary form. Anna is the wife of British army officer, who lives the life of a reluctant memsahib on the British cantonment in a fictitious Indian town called Kandaipur. I started writing the Indian section of the book in the late nineties when my children were small. Back then it was entitled Shivaji’s Ladder. At that time I did a lot of research into the social history and lives of the British in India during the latter years of the Raj which I drew upon when I was writing Anna’s story for The Foundling’s Daughter. In my next post I will describe what I found out about the lives of British ex-pats in the British Raj. Thanks to Kraftireader for a lovely review of the Foundling’s Daughter. The paperback is out now too at the following link. 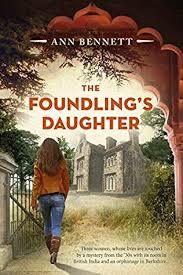 The Foundling’s Daughter is the story three women connected down the decades by a mystery from the 1930s, with its roots in British India and an orphanage in Berkshire. In 1934, Anna Foster, the young wife of a British Army Officer, privately harbouring pain and remorse, sets sail from Bombay on a fateful journey home, a letter from a charismatic stranger – orphanage superintendent, Reverend Ezra Burroughs – in her pocket. Sarah Jennings, escaping an unhappy marriage, moves to be near her ageing father. She buys Cedar Lodge, the crumbling former home of the Burroughs family, a renovation project she hopes will bring peace of mind to trying times. But she’s not prepared for the shocking secrets she uncovers.Determined to track down the past, Sarah embarks on a quest to expose the chilling events that took place at Ezra Burroughs’ orphanage in the 1930s; a quest that will ultimately change her life.